The month of August is probably the most active in the Empire. Celebrations, social movement, politics… August never disappoints. However, this month of August was not the happiest in imperial history. On the first day of the month, the Empire Day was celebrated. 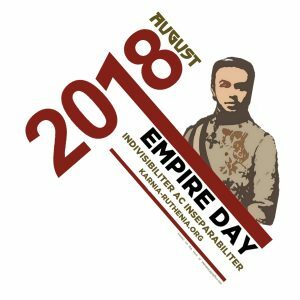 As usual, the List of Honors of August brought new names to be listed among the empire’s most distinguished citizens. However, it was a much shorter list than in previous years. Was the monarchy hardening its criteria? On 06 August, is Imperial Majesty’s Diplomatic Service resplended during the Congress of St. Louis, hosted by the most important ally of the Empire in North America, the Grand Republic of Delvera. However, the congress would become a bilateral meeting, considering the absence of half of the four invited participants. If, on the one hand, the congress seems to have lost its importance, it is much more probable that the logic of Charles Darwin applies to micronationalism as well. Micronations with less complexity and political depth do not conform to norms – this is the result of the Congress that ended on 25 August. On 16 August, Karnia-Ruthenia and the Empire of Lemuria signed the Treaty of Saint Michael of Socotra, earning for the Empire another expansion and the creation of the first protectorate of the imperial history, the Karno-Ruthenian Protectorate of Socotra. If foreign policy is strengthened, the legislative gap weakens the empire’s democracy because of the politicians themselves. The yearning for democracy comes from the central power, while the people seem to wait for an authoritarian resumption of power by the Crown. The solution to this situation may come from a meeting scheduled for 04 September, when the Emperor will receive the Minister of Justice, Prince Wilhelm von und zu Hochbach-Kundarheim, at a state dinner offered in his honor. In relation to social events, these were deeply shaken by the passing of Prince Alexander Fejes de Balógh, the Emperor’s godfather. The fact occurred on 07 August, and with a period of one week of mourning at Imperial Court, it threw a black veil over the Emperor’s Day celebration, to be held exactly a week later, on the Sovereign’s birthday, on 14 August. The celebration was drastically reduced, and split with the Fathers Day celebration in the capital and the return of the Archduke Ari to the Court after a period of three months in the northern region of the Empire. The last event of the month took place on 19 August, when the Solemn Mass in honor of the patron saint of the Empire (and also of Hungary), St. King Stephen of Hungary. On this occasion, in support of the Youth Group Árpád, the Emperor offered a generous donation, in the form of a replica of the Holy Crown of Hungary, which the youths delivered to the community of Persenburg (and the community of Vila Anastácio, the neighborhood surrounding the capital imperial). Thank you so much for giving everyone an exceptionally spectacular possiblity to discover important secrets from this web site. It’s always very nice plus full of fun for me personally and my office colleagues to search the blog at minimum 3 times in a week to read through the new items you have. Not to mention, we’re usually satisfied with all the mind-boggling strategies you give. Selected 4 facts in this post are ultimately the finest we’ve ever had.